She told me she’d get started during the drive. She REALLY wanted to see Captain Marvel again. I’d be lying if I said this was the first time. She was similarly ecstatic for Wonder Woman. She cooed at young Diana, stared in wonderment as she fought on beaches and alleyways, and cheered at her epic costume reveal. During the No Man’s Land sequence, my daughter stood up in her chair. I apologized to those sitting behind us, but they didn’t mind. “That’s Wonder Woman!” she said, smacking my shoulder like I wasn’t watching. I was watching her. I saw her recognize and identify in someone who looked like her, who could be her, or someone whom she could aspire to be. As boys, we grow up with a certain privilege. We get to see ourselves on screen not just in superhero movies, but in every. other. movie. We get to be Indiana Jones, Luke Skywalker, Han Solo, James Bond; imagining ourselves in Westerns, in Middle Earth, as Pirates in the Caribbean, as agents in the IMF. Prior to Wonder Woman, when this comic book-superhero craze was in its relatively nascent stages, I’d ask my daughter, “who is your favorite superhero?” She’d cycle through them like she couldn’t decide or settle. Iron Man. No, Captain America. No. Hulk. Maybe Thor? There had to be a right answer, but she couldn’t find one. As the MCU blossomed, she’d become more aware of who these characters are and I’d ask again. Black Widow, she’d say. The Red Girl (Wanda). Or the Green Girl (Gamora). I couldn’t fault her for not knowing these characters upfront. Their names aren’t in big bold letters for all to see. Characters like Black Widow, Wanda, and Gamora have to share poster space; are 4th or 5th in the opening credits. For a time, they didn’t even have their own toy line. I’d get my daughter Disney princesses and Barbie dolls. Not once did I stop to think why there weren’t any ongoing Batgirl or Supergirl action figures. Supergirl has her own show. As pivotal as these characters are in the comics (with their own origin stories, arcs, and animated series), they are too often sidelined, left to complement or complete the otherwise alpha male super-pack, in a film history full of predominantly male super-packs. Everyone knows Thor and Captain America, Clark Kent and Bruce Wayne. I can’t blame kids if they don’t know Wanda also goes by Scarlet Witch. 20+ films and neither Wanda, Black Widow, or Gamora have their own solo ventures bearing their name definitively in bold. Hulk has had 2 solo movies, was recast each time, and not only gets to be in every Avengers film, but also had a co-starring role in Thor: Ragnarok. Black Widow’s been in the MCU since Iron Man 2. I know what you’re thinking, they’re just movies, shows, toys. Speaking as a superhero-crazed kid, these are not *just* movies. They’re icons we attach our whole childhoods to – something we’ll look back on fondly, and will have a hand in shaping us. No, an action figure won’t shape us. It’s the opportunity to cherish an idea or belief – and be encouraged to cherish those ideas and beliefs – that inevitably will. Us boys, we grow up spoiled and entitled. We’re Superman, Batman, the X-Men, Spider-Man, Iron Man. We get to have our masculine cake and eat it too. The sheer breadth of these comic book adaptations is fandom at its most fervent, but also exclusion at its mightiest. These characters get to save the day, have their big hero moment, and get the Lois Lane, the MJ, or the Pepper Potts of their dreams. So much of our experiences with superheroes adopt this copy and paste structure that it’s no surprise some of us want these movies to stay the way we remembered them, and why anything else is perceived as a threat. It’s hard to see Wonder Woman and Captain Marvel as a “threat” to anyone’s existence so much as it is a long-awaited and overdue acknowledgement of those who have been shunned, damseled, and sidelined. Like Black Panther, Captain Marvel is an exhale, a sigh of relief; a more than welcome sight and sentiment that – as grand as this universe is teased and made out to be – it has room for the rest of us. And my, has it been felt. My daughter hollers like crazy whenever Carol Danvers photon-blasts the hell out of Yon-Rogg. When she mock-screams at the Skrulls. When she blows her hair as she boards the train, pays no mind to the d-bag on the bike asking for a smile, then when she steals said d-bag’s bike. When she dukes it out to No Doubt’s “Just a Girl” – which is now my daughter’s favorite song (in a household that regularly plays “Let It Go” and “Be Our Guest,” this is a big deal for me), and especially when she takes on the Kree bombers, showing it up to Ronan. I love it. And I love that my daughter loves it. I get that others find Captain Marvel mediocre, boring, or formulaic, but our complaints feel beside the point. Because it’s not for those of us who’ve been lifted up and empowered all our lives, but for everyone else who finally have that same opportunity. 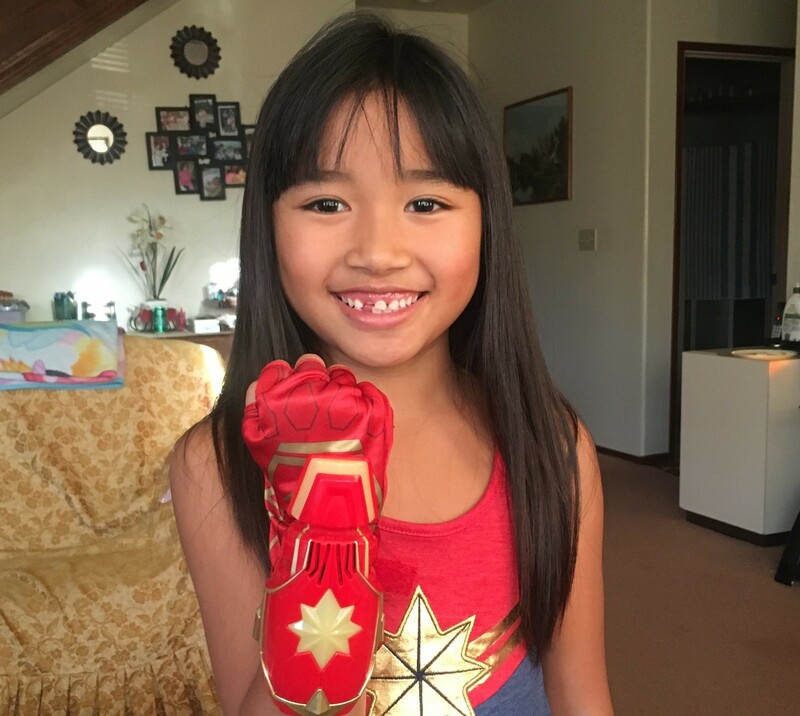 My daughter’s face enlivened and enchanted, Captain Marvel is iconic to her. That’s what matters. I’m sure in due time we’ll learn about Carol’s backstory, but the clipped flashbacks brought on by her brainwashing and amnesia serve a greater function. It’s not as important to know the details of what she’s been through; it’s that she falls, and gets back up every time that’s felt. The gaps in Carol’s memory opens doors for identification. Her backstory is for others to inject freely. It’s the audience’s story, every little girl’s story. It’s no wonder why my daughter is completely bonkers and obsessed, why, at the beach over break, she waved to me as she tripped over nothing in the sand and rose to her feet asking, “Who am I?”; why she wants to be surrounded by nothing but Captain Marvel-themed everything. (Pray for my wallet.) She believes she is Captain Marvel, the same way I got to believe I was Superman, Batman, Spider-Man, so who am I to tell her she’s not? Perhaps one day she will. Carol Danvers is sure to get her own trilogy and starring roles in the next Avengers lineup and so on and so forth. I’ll do everything in my power to make this meeting happen, but I do know for sure that I’ll be taking my daughter to see movies like Wonder Woman and Captain Marvel as many times as she likes. I’ve had plenty of superhero moments in my life. Now, it’s her turn.